Book now the best shore excursions in Tunis. High quality and safety at the lowest prices. If your are looking for the best Shore Excursion Tunis, book now the best guided tours at lowest price with Ancora Tours. Since 2003 we offer you official guides in english, transportation and travel insurance, all included. The highest quality at the lowest rates. The shore excursion to Tunis gives us the perfect opportunity to discover the spirit of the Tunisian capital. Lets dive right in to the flurry of activity we’ll find in the city centre, admiring the Arab architecture as we go. Then lets stop at Carthage for a quick history lesson, before unwinding in the beautiful town of Sidi Bou Said. What’s eating: Some very more-ish Turkish Delight. Souvenir: Pashminas, slippers, hats or ceramics. Our Tunis shore excursion begins at the joining of Avenue Habib Bourguiba and of Avenue Mohamed V, two of the main streets in the city centre nearby Kasbah Square. Here in the centre of Tunis we have the opportunity not just to visit the city but also to experience Tunisian life. In the historic area known as the Medina, there are 700 monuments including palacea, mosques and fountains to see. Lets absorb the bustling atmosphere and visit the best local markets, otherwise known as souqs and explore the local sights. We’ll admire the Arabic architecture of the Dar Hussein building, which houses the National Institute of Archaeology and Art. Once we’ve explored the city centre we return to the bus and head to Carthage, the famous rival city of ancient Rome. We’ll take a look at the ruins from outside the archeological site, and our expert guide will reveal what life was like for residents of this once great city. Carthage was known as a maritime, commercial and military power that was often in conflict with the Romans. Today the ruins testify to the greatness and magnificence of this city. 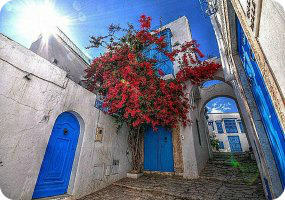 Next, our Tunis shore excursion travels to the town of Sidi Bou Said. Here the mood is altogether different; the whitewashed houses with blue windows and doors create a sanctuary for visitors. These ancient buildings, carefully restored and adorned with blooming flowers are now the symbol of Tunisia. The town itself sits on top of a steep cliff, providing us with some spectacular views of the Med, a truly stunning spot in which to end our Tunis shore excursion. NB The excursion will not visit any shopping district.